In all honesty, I don’t eat a huge amount of Dutch food. Yes, I live in the Netherlands – but it seems that even the average Dutch person doesn’t eat that much of their national cuisine – especially those who live in Amsterdam. And yet, when I’m approached to write articles, it’s the topic I’m most likely to be asked to write on. 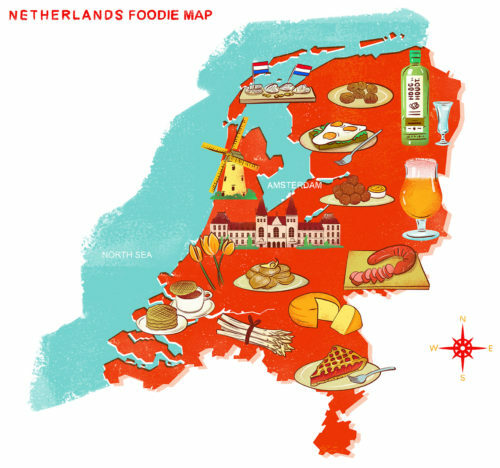 A while ago, I wrote this post on Dutch food and drinks for Eating Amsterdam; they’ve commissioned a set of “foodie maps” – illustrations of the national cuisines of the Netherlands, Czech Republic, United Kingdom and (soon) Italy, and where each dish comes from in the country. I thought the Dutch one was cute (it’s so orange!) and I was interested to teach myself about the origins of the various Dutch foods I take for granted. So I did a little research and this was the result. 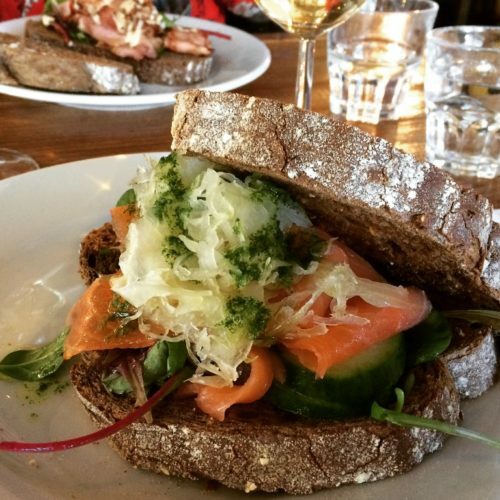 There’s very little Dutch food in Amsterdam that’s both sophisticated and true to its traditions. But Floreyn walks that line perfectly. Think bitterbal, but then filled with Messeklever cheese and served with smoked beetroot, radish, apple and fennel. Or mustard soup that’s been deconstructed into a clear broth with a cheese foam and three types of mustard. Even dessert uses local, seasonal vegetables: carrot and parsnip ice cream with a sweet hutspot and citrusy crème brulee. This is very accomplished cooking that stays true to its Dutch roots. It may not be cheap, but the quality of Floreyn’s food and wines, as well as its great location in de Pijp, is more than worth the price tag. 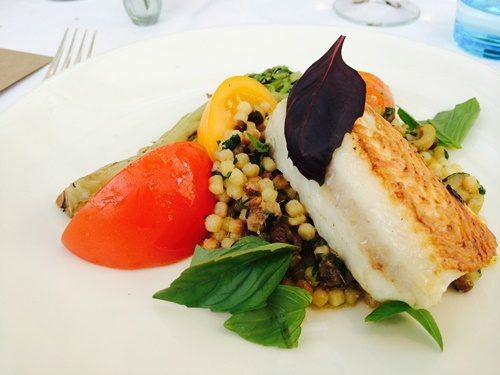 Want to eat more than just Dutch food? Download my comprehensive Amsterdam restaurant guidebook here. 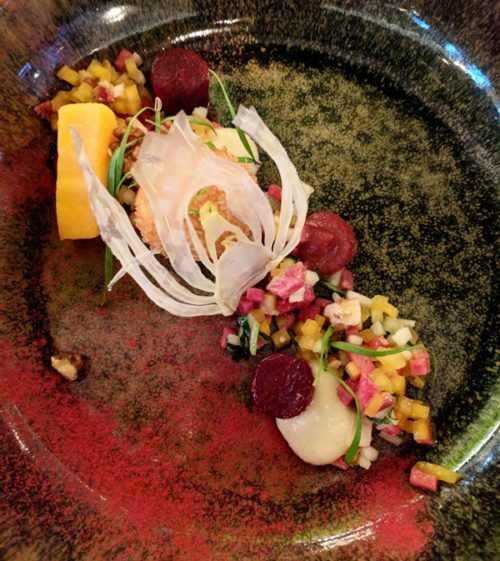 Whether you choose to go to the original Wilde Zwijnen or the newer Eetbar Wilde Zwijnen, you won’t be disappointed with the modern Dutch cuisine on offer. 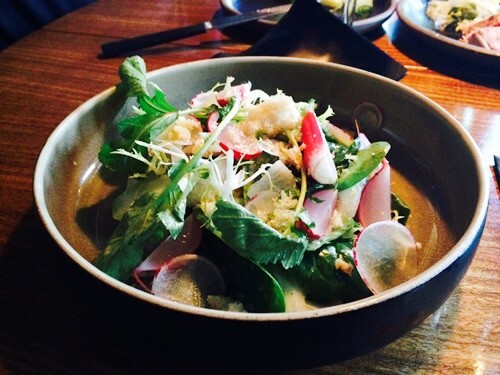 I prefer the Eetbar personally – they serve small, shareable plates of creative, seasonal food prepared with care. Slightly disappointingly, neither restaurant generally seems to have wild boar on the menu, but perhaps I’ve just been unlucky. The quality of the other meats, however, is excellent. You can’t get much more local than plucking your fruit, veges and herbs from your own garden or greenhouse. And that’s exactly what de Kas (meaning: greenhouse) does at their Amsterdam restaurant adjacent to the Frankendael Park. What they can’t source from their own grounds, they procure from nearby farms. The menu is heavy on vegetables (unsurprisingly) so dinner at de Kas leaves you feeling light and a little virtuous, too. While Gartine also has its own moestuin (allotment), it’s not quite as close to the restaurant as de Kas’s – which is hardly surprising given that Gartine is sandwiched between the Kalverstraat and the Rokin in the centre of town. I should more properly call it a “tearoom”, as it’s open for breakfast, lunch and afternoon tea, but not dinner. The location is delicate and classy, but in an old-fashioned way – as if your grandma had taken a degree in interior design. The food is likewise: eggs benedict with salmon for breakfast, crayfish rillettes for lunch, and a plethora of tarts and cupcakes at tea time. While the menu doesn’t exactly scream Dutch, everything is made with such local products that I think it classifies for inclusion. A few years ago, the Spaklerweg was somewhere you’d go to find a DIY store – not somewhere you’d stay or eat. But the Amstelkwartier has been growing fast, with hundreds of residential apartments, hotels that serve the Amstel business park, and now restaurants too. In the sustainable-luxury QO Hotel, you’ll find restaurant Persijn cooking up Dutch food for locals, visitors and business travellers. 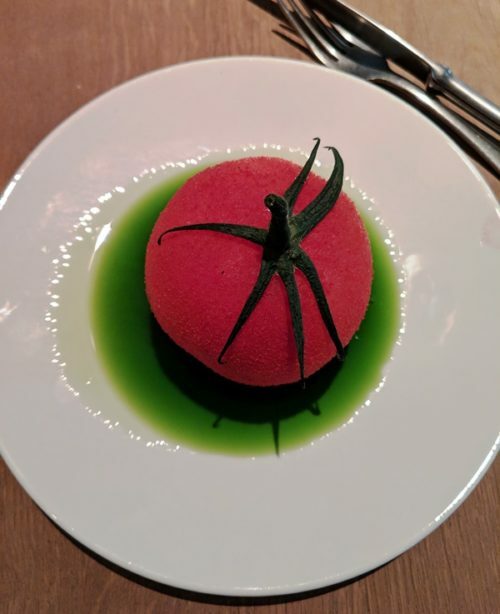 Their signature dish is a whole tomato, peeled and hollowed out, filled with a mozzarella and basil mixture and served with basil oil (pictured below). You’ll also find takes on Dutch classics like stamppot (mashed potato) with beef succade, and a chocolate dessert featuring traditional Dutch East India Company spices. You can’t visit Amsterdam without trying the legendary Dutch pancakes (although the Honey Badger had been living here nearly four years before I finally remembered to pop his pancake cherry); and where better to try them than the place of the same name? 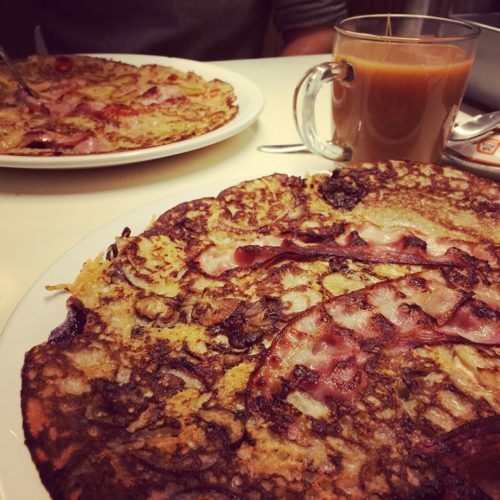 Pancakes Amsterdam serves some of the best versions in the city, and while you will see plenty of tourists, locals do treat themselves to the occasional pancake there too. Of course, you can order the regular toppings (ham and cheese, apple and stroop, and so on), but you’ll also find some more adventurous combinations. I tried one of the house specials: camembert, ham, chicory and raspberry sauce – it sounds odd, but it was strangely addictive. The Honey Badger went for a sweet-n-savoury combo of bacon, bananas and chilli – it was equally tasty so I demanded we share. If you’re looking to buy Dutch (organic) produce and have a bit of time on your hands, hop on your bike and head over to Schellingwoude. As the name would suggest, Landmarkt sort of resembles a covered market (or perhaps just a very nice supermarket) filled with the best quality produce – including meat, fish, fruit, vegetables, cheeses, charcuterie and the rest. It’s not always Dutch (they do sell bananas that clearly don’t grow here, as well as some other produce that isn’t in season in Holland), but it’s still a good bet for finding truly local, top-quality food all in one place. Try some of the cheeses from the farms north of Amsterdam – heerlijk! This post was first published in May 2016, but has subsequently been updated to reflect new openings.